Diving deeper into one of gaming’s biggest and mysterious games. 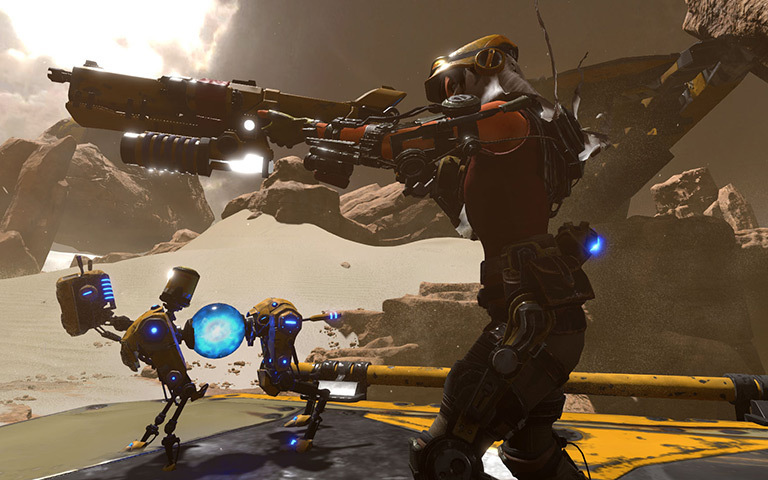 If there were a game category for “Most Living” within this years E3 convention it would hands down go to ReCore; an inventive, colorful, risky, sizable adventure title from the creators of the (now) classic Metroid Prime series. 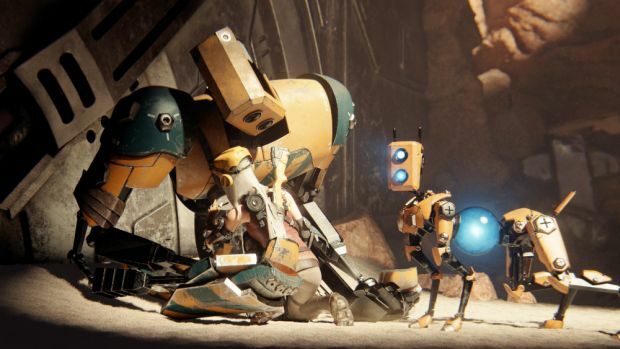 ReCore‘s depth of life on an inhospitable alien world where there really isn’t much life around is astounding; it’s not just the moving and the shaking that makes this game feel alive either. It’s the depth of nature allured by technology that really brings out the best moments in ReCore. 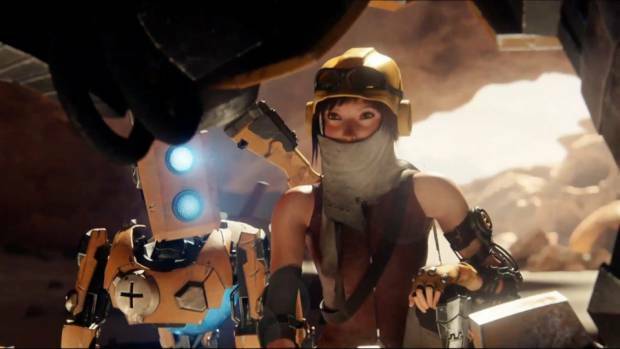 ReCore‘s protagonist, Joule a young and energetic woman, awakes from a cryogenic sleep and finds herself stranded on this planet after some menacing things go foul on her way to Far Eden. Robots and machines that were designed to help Joule begin to malfunction and turn — well, not so good. She still has a few different models that want to help out, but it’s going to take a lot of work to get through this mess. "The platforming was solid; very strong. With a good platforming game you’ll definitely need precise controls — you don’t want this to feel like a Mega Man/Metroid Prime knockoff." One of the first things I noticed from ReCore was it’s pallet of colors that are so whimsically used throughout the short demo that ranged around 10 minutes. Within this cavern/factory hybrid that introduces some cool obstacles, detailed enemies, and a few tasks that had to be accomplished. Now where exactly did all this lead to? It’s not really clear from the E3 showfloor demo, as the pieces were purposefully vague and I was never quite sure which part of the game I was on chronologically. Within this factory, Joule is getting from location to location through platforming and light puzzle solving; all of which seemed to clearly represent not only a strong Metroid Prime vibe, but also a Mega Man style, as well. That’s interesting because one of the leads behind ReCore is Keiji Inafune — the creator behind the Mega Man series. The platforming was solid; very strong. With a good platforming game you’ll definitely need precise controls — you don’t want this to feel like a Mega Man/Metroid Prime knockoff. Within ReCore the controls felt not only smooth but nice and tight. Razor sharp turns, jumps that were precise, and shooting mechanics that felt almost natural. "It was quite to switch between these colored ammunition to take on enemies with the correct colors; it’s something I found extremely unique and not often done in games of today." Joule is followed by three robots that want to help her solve the mystery on why she’s on this lost planet and protect her from the evil robots also. These robots can be called upon, summoned and used in battle. They also play heavily into puzzles throughout the part of the demo where certain things could only be accessed by certain robots, depending on the color each robot respectively has coordinated on their metal frame. Enemy types are sometimes extremely unique and go just beyond the usual shoot/kill scenario. Some of the more advanced enemies have colored cores in their bodies that must be attacked by a certain colored robot within Joule’s arsenal of mechanical warriors. And the even more advanced enemies have cores that change color while fighting, making it that much more difficult to defeat as you may have to continually switch out robots from time to time. Joule is also equipped with a strange energy weapon that shoots colored energy. It was quite to switch between these colored ammunition to take on enemies with the correct colors; it’s something I found extremely unique and not often done in games of today. It felt like a nod to Mega Man in that sense; when Mega Man reaches the level boss and destroys the boss with a certain weapon type. "The ways that lead to the paths that must be taken are often sidelined by backtracking to find another way around through clues and unlocks much like in a Metroid game, which made it that much cooler." Overall, there wasn’t much time allowed within the demo, but what was there revealed a whole lot of character from what Comcept Armature Studio really want to show that they can accomplish. As an Xbox One/Windows 10 exclusive I feel as though this game is going to be a great addition to the ever growing library of games already out there, and it will definitely be interesting to see if the entire game holds up as well as the E3 demo had.